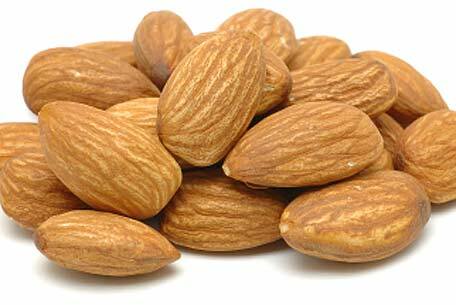 Few ingredients improve the flavor, texture and appeal of a menu item like almonds. That’s the consensus of a couple of accomplished chefs who make their living creating culinary sensations. At the Renaissance Long Beach Hotel in Long Beach, Calif., the versatility of almonds shines in multiple forms. They create exciting signature dishes at Sip Lounge, the hotel’s restaurant and cocktail destination, lend exotic global nuances to banquet dishes and boost the flavor of salads while keeping calories in check. Highlighting almonds grown in California, the source of about 80 percent of the world’s supply, is natural for executive chef Michael Poompan who describes his cooking style as “the best of California on a plate.” He taps in-state sources for grass-fed beef, extra virgin olive oil, fingerling potatoes and many other ingredients as well. One of his discoveries is an unusual savory fruit compote made by stewing whole almonds with pears, dried cherries, apple cider vinegar and maple syrup. This adds flavor and texture to the farro served with Pork Porterhouse, a new Sip menu item. “This otherwise might have been a sweet compote, but the addition of almonds lets it cross into a savory direction,” says Poompan. Mixed with the farro, it is a fitting side dish for a hearty meat entree. In addition, Poompan says that he often swaps chopped natural almonds for cheeses in signature salads to create new flavor effects and increase nutrition appeal. Finding inspiration in the cuisine of Indonesia, he riffs on the classic green beans almandine by combining sliced almonds, toasted coconut and chilies. Turning to India, he makes a sauce of almonds, onions, garlic and water that Indian chefs use as a flavorful and nutritious addition to a vegetarian dish like saag paneer, spiced spinach with fresh cheese. But there is more to almonds than flavor, texture and nutrition, Poompan has found. They also give superior holding ability to his gluten-free Parmigian Chicken, which is dredged in rice flour, dipped in egg wash and coated with equal parts of ground almonds and Sonoma Dry Jack cheese. After frying, the chicken is crunchier and less oily than breadcrumb-coated chicken. More importantly, it holds its texture on the buffet line throughout service. Also exploring the flavor-enhancing ability of almonds is Tim Griffin, manager of culinary for Brick House Tavern + Tap, a casual gastropub restaurant concept in the Houston-based Ignite Restaurant Group, with 15 locations. Griffin’s spring menu will feature new almond-based toppings, crusts and sauces. One of the newcomers is romesco sauce, a Spanish-inspired blend of toasted, sliced, blanched almonds, roasted red peppers, extra virgin olive oil, garlic, shallots, vinegar and fresh bread crumbs. It is a zesty accompaniment for the new Seared Halibut with panko and prosciutto crust. In addition, Griffin is reformulating the company pesto with almonds to improve the flavor profile. He prefers the “the unique floral background” of almonds over nuts with more overwhelming flavor. Likewise, the popular Thai Chicken Salad is being recast with almonds rather than its current nut ingredient. “Actually, the crunch is much better with the almonds,” says Griffin. For recipes and tips for using almonds in inspiring ways, visit www.almondboard.com.